I can hear the thought processes out their already, churning away in pre-anticipated fear. “Oh no, he’s writing about change again, he’s up to something!” Yes, well, change is an invevitability of being human. I don’t do it on purpose but when I change things it is because the change is going to mean improvement, or it means growth, or it means opportunity and new adventures. One thing above all drives any change we make at Space2Create and that is the people involved. Ultimately every decision or change we make has to mean better opportunities for those vulnerable people we support or an opportunity to support more people. So decisions about change with careful planning and thought….mostly. You know how life is. it throws up the unexpected. Change takes many forms. Organisational change is one of those corporate concepts and whole books have been written on managing that change. I think to the days we first started at Workbase. An amazing charity that unfortunately closed down. 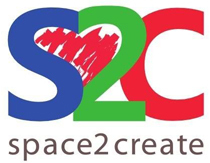 Space2Create started from it’s legacy. The thing here is how different people reacted. The individual who refused (and still does) to attend S2C because it is not Workbase. And of course when we moved into the Factory that was another big organisational change, which proved to be a good move and has allowed us to grow. Having suffered with and worked with people with mental health conditions I am very aware how difficult change is to cope with. As a charity that is involved with many people in this position I am painfully aware how difficult change is for them. I always found that in order to cope I had to take at least one familiar thing along with me in the change, something to hang on to. I remember when I first went to Workbase as a service user. The initial fear was overcome for me by taking a painting I was doing at home and doing there. I sat with hood up concentrating on the painting and in a way kept myself at home in a new location. It worked for me. It enabled me to take that first step to get out again after serious illness. From there I have just steadily grown (with a few wobbles!). So I offer you the reassurance that we are looking to get better, do better and do more. It is nothing to be afraid of. We will not abandon anyone and we will support our service users better and better. Watch this space. Space2Create is a good example of this. Eight/nine years ago a good friend of mine Jo and myself were in a charity that was struggling to survive amidst budget cuts and funding from statutory bodies being withdrawn. As volunteers who had been service users we appreciated how creative activity had helped us recovering and saw the same in those around us. We started an art group called WellArt which met once a week. When the charity closed that group formed the basis of creating S2C but it was Jo and I pushing it, bringing on board a small core to form the trustees of the new charity. These sam people drove S2C on to grow and reach where we are now and that same core (with additions as we grow) pushes us on to bigger and better things.. I see that same drive and care in other organisations. In Kendal the Peoples Volunteer Café takes unwanted food donated from local shops and people then turns into meals for local people, many struggling to afford to feed themselves or their families due to unfortunate circumstances. Helen had the vision and again a small team was created to drive the idea through with passion and belief. The People’s Café currently run on Saturdays serving lunch at the Foyer next to the Bus Station. They would very much appreciate your support, time and food donations. Another Kendal based organisation, Creative Arts, does amazing work supporting adults with disabilities through creative activity. Lana has driven this with a dedicated team around her building this from a small group to the Creative Arts Hub in the Westmorland Shopping Centre and delivering some amazing community projects. All three organisations share a common thread of that driving force of a dedicated team with an individuals passion for what they are doing at the core. We all need similar things too. Volunteers, resources, space, support from local authorities, funding, presence, advice, admin…….the list goes on. What is great between the three organisations is that we are increasingly working together. Sharing volunteers, people who volunteer for two or more of the organisations. Sharing skills and knowledge. Sharing resources. Most importantly sharing support so that none of us is ever isolated and alone. Working together we can build better communities reaching out to the different people who need help for all the different reasons and providing them what they need to keep going at their most difficult times. I celebrate all three organisations and look forward to working ever more closely with each other. Have you met the Moomin Lawyers? I don’t have much to say this weekend as it has been a week of long ranty posting in defence of Kendal and the Comic Arts Festival. It is here now and it’s great because a diverse range of experiences and people hit this old grey town with a big splat of colour and joy. Get out and support the festival. And while you are there maybe drop by and see or do some of the things that support the vulnerable in our community as well as raise awareness of issues such as food poverty, homelessness, mental health and conditions. Between 11 and 3 Saturday you could head along to the Peoples Volunteer Café in The Foyer next to the Bus Station where they are holding Moomin Café with pay what you can food (always fantastic) and activities and prizes of a Moomin nature for kids of all ages. Also don’t forget the Comic Art Windows Trail through businesses across Kendal. Space2Create are number 1 on the map in the Kendal Antiques Centre with our very mental health take on the Moomins. I think my favourite point of the entire week was the discovery of Moomin Lawyers…….anybody want to draw one. These made a polite enquiry (apparently) having seen S2C twitter posts regarding our windows trail and the legality of it in terms of copyright. Also regarding the Moomin Café for the same reasons. This is why the Comic Art Festival Organisers are so good because they immediately pointed out a few realities about both and just how silly complaining looked. All good now, the Moomin Lawyers have headed back into Moomin Valley…………. Tuesday 10th Of October is World Mental Health Day. I always feel in two minds about having days where some ‘celebrate’ a cause. For one thing, tolerance, understanding and stigma are things that should be highlighted and constantly delivered across the year, not just on a special day. Are we to celebrate the continuing apparent decline in Mental Health Services or maybe we should celebrate the increasing burden being shouldered by the Third Sector to provide services the State is not. Should we celebrate that when I visit my GP to talk about my Mental Health the first place they refer me to is a charity. What can I say. Space2Create work with the local NHS Mental Health Services providing sessions twice a week on the ward to support both the patients and the staff! They trust us to be able to bring people off the ward to spend a half day at Space2Create, they use our rooms to run courses for outpatients because it is a safe and welcoming environment celebrating creativity. If that speeds up the recovery of a person in crisis then that is worth celebrating. And so to the Moomins. Because of World Mental Health Day we wanted our Lakes International Comic Art Fest trail window to have a Mental Health theme. It always struck me how many Moomin tales can be quite dark. There is always a journey and a return home which we felt lent itself well to having a Moomin Mental Health story. So we tell the tale of Moomin Troll and his illness, being rejected and passed around services in the real world before finding the support he needs to return home. In the Kendal Antiques Centre (number 1 on your trail map in the Comic Art Festival Brochure) we start the tale in the window and continue it around the bays with little diorama’s telling the story. Although it is dressed up in Moomins the tale comprises real life experiences by people coming to S2C. Psychiatry sessions being limited, wrong medications being given out, spending the night in jail when in a crisis, having to find your own support, then attending Space2Create (or any of the great charities supporting mental health issues in Kendal such as Mind, Growing Well, Creative Arts Hub) to finally find their way to recovery and home. This is not fantasy, it is a reality experienced by myself and many other I have spoken to over the years. So do celebrate World Mental Health Day but when you are being understanding be understanding all year round, when you fight stigma fight stigma all year round, when you take time to listen take time to listen all year round, when you are being tolerant be tolerant all year round and when you are showing understanding show understanding all year round. We need you to not do what we ask you………? Managers Blog: We need you to not do what we ask you………? Well indeed we do. As a mostly volunteer run organisation it all gets very tricky if you don’t have enough volunteers! I know I sometimes find it quite tricky to get new volunteers to fit in because it takes a little time to learn about the things that need doing and to start doing them as well as to work out how S2C works. In some organisations there are very rigid structures and roles but because at S2C we are in the business of building the confidence of our service users then we try and get them to help out and do the jobs as part of their recovery. So it might be you are a volunteer who wants to lead creative sessions but alongside this it may be rather than lead a session you support a service user with an idea for a session to run that session. You might be a volunteer who is interested in framing and hanging, again it might be that you are doing this but then it might be you teach those skills to a service user and support them to do it. So I guess I am trying to get volunteers to not do the roles we ask them! Clearly there are some limits to this, for example in dealing with confidential service user details or in working one to one with an individual who needs to talk then these roles need those volunteers with the skills to do this and confidentiality has to be maintained. So it seems odd but the role is almost stepping back and letting somebody else do it while supporting them. Of course the volunteer needs to be there because in dealing with vulnerable adults it may be that they are unable to finish a job or can do it one week but not the next, that is where the skills of the volunteer need to be, in understanding how much intervention is required but allowing a vulnerable person to grow. This list is a suggested one! Fundraising- both the smaller events and activities and also helping with the bigger bids through applications and letter writing. Social media- finding a way to develop our use of social media. Shows and events- representing S2C at events and shows. Session leaders…those with an artistic background to do regular sessions or artists just coming in for one or two sessions. We want to do more at S2C to support the people we work with. We are not a massive charity but by providing the sessions we do and by facilitating other groups to use our space and resources we probably help around 100+ people a week in one way or another. Can you help us?